The fake webpage used by fraudsters in a new scam targeting NCB customers. 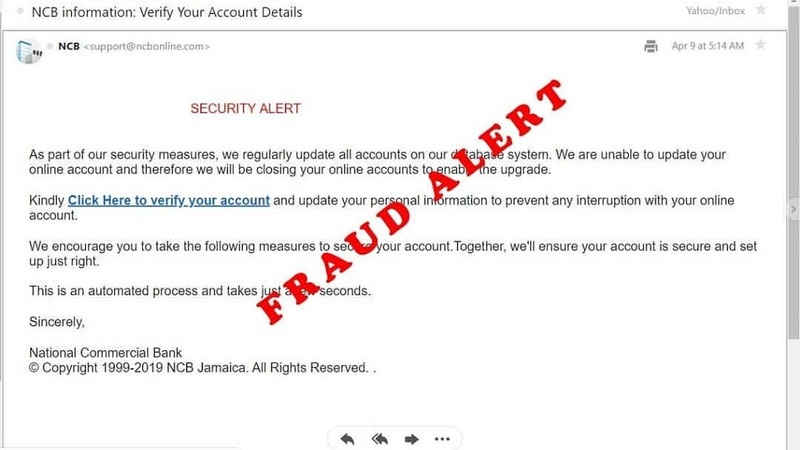 National Commercial Bank (NCB) says fraudsters have sent out “cleverly disguised emails” to its customers in an attempt to steal personal information. According to NCB, the emails ask customers to click on a link to update their personal banking information. 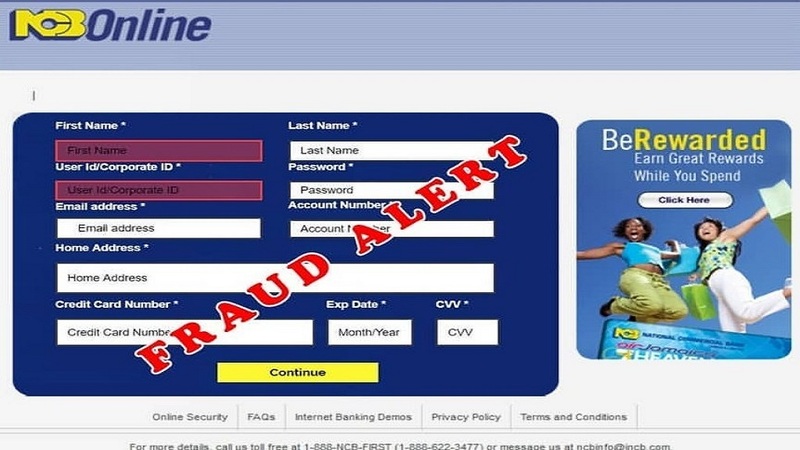 The link then takes unsuspecting customers to a fake webpage which bears an uncanny resemblance to NCB’s online banking portal, asking them to enter their personal information there. “If you responded to an email recently asking you to click on a link and provide your personal banking details, please contact us immediately or visit our chargeback portal at chargeback@jncb.com so that we can help you to secure your account,” urged Lloyd Parchment, Fraud Prevention Manager at NCB. This kind of fraud, more commonly known as phishing, occurs when scammers try to trick unwary persons into divulging their passwords and other private information via email, the bank said. According to Lloyd, although NCB continually invests significant resources in the fight against cybercrime, customer vigilance is critical to closing the gap. To this end, he said NCB has taken many steps to educate customers with safety tips and advice on how to protect themselves and their money from cyber criminals. The fraud expert, who has over two decades of experience in the field, also shared a few safety tips for customers to use to protect themselves from phishing attacks which, according to the Cyber Security Breaches Survey 2019, published by the UK government, is the most common type of cyber attack. Safety tips include carefully scrutinising the email address from which the message is sent, and checking for things like grammatical errors and contact information. Since 2016, NCB has invested over $2 billion in global technologies and certifications, and added a number of advanced security features to its fleet of automated banking machines (ABMs) and Bank on the Go kiosks. Other measures taken against fraud include the issuing of chip-enabled EMV cards, and the implementation of RSA SecurID, a world-class dual factor authentication technology designed to enhance the protection of customers’ online banking accounts. NCB continues to invest in fraud analytics tools and monitoring, and affected customers are typically reimbursed within four days, or less.